Elevates print and digital design to a new level! QuarkXPress is the leading graphic design and page layout software for creative professionals. It’s used by hundreds of thousands of users around the world who value quality and performance in their daily production of print and digital projects. 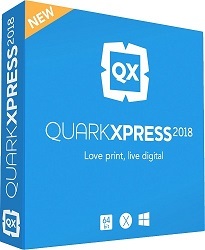 QuarkXPress 2018 is sold as a perpetual license with 60-days of free support, free dual activation, cross platform licenses (Mac and PC) and ongoing access to free updates. For many years the changes in typography have been incremental rather than radical…that is until color fonts emerged. (Emoji icons on your phone are examples of color fonts.) While browsers have supported color fonts for years, print publications have ignored them until now: QuarkXPress 2018 is the first layout application that fully supports Color Fonts. QuarkXPress supports Color Fonts in SVG, SBIX and COLR formats. And you can use them in print, PDF and digital outputs. To get a sense of how Color Fonts work and how they will open up a broad new space for your creativity. Quark requires that you verify your academic proof after you receive the software to obtain your serial number. Get the tools you need to be prepared for the job market with a suite of Portfolio tools! The ideal small-format choice for anyone with a serious creative passion in photography, art or design.